OSHA has revised its Hazard Communication Standard to include new GHS labeling elements and a GHS standardized format for Safety Data Sheets (formerly known as Material Safety Data Sheets). 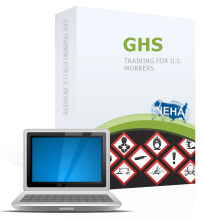 This course introduces workers to the GHS and provides them with the information necessary to readily locate information about workplace chemicals, as found on GHS product labels and on the new SDSs. This course is designed for U.S. workers who have the literacy skills required to read and understand print material. At the end of the course, there is a test. To confirm their understanding of course content, participants must successfully complete the test. Participants that do not achieve 100% can review the content and re‐take the test as many times as necessary. Test questions are randomly selected from a test bank, making each test unique. $29.00 (USD), Bulk dicsounts available.